Opening/Synopsis: “Quick! Close your mouth! Especially if your eyes feel droopy, your shoulders feel sloopy, and your mouth feels like it wants to stretch open wide to let out a great big yawny yaaaaaaaawn – hey, you were supposed (to) hold it in! Oh, dear. You know what happens next, don’t you? 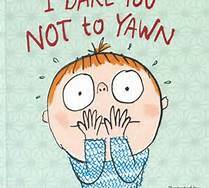 Boudreau and Bloch’s I Dare You Not To Yawn is a delightfully subversive bedtime book. Written like a quasi-how-to manual on bedtime avoidance, our young narrator, warns us that “yawns are sneaky”. According to him, it’s best to avoid snuggly things, cozy pajamas, bedtime stories and sleepy time songs, – or you’ll wind up in bed, wondering just how you got there. After exhausting (pun intended) a rather long list of possibilities, the little boy inevitably succumbs to sleep – yawns are sneaky that way! Boudreau’s light and playful tone is complemented perfectly by Bloch’s loose and expressive artwork. I dare you not to love this book! Why I like this book: I Dare You Not To Yawn is one of the funniest bedtime books I’ve ever read. My kids loved it too. There are lots of opportunities to “ham it up” but, be forewarned, the giggles and the yawns are contagious! What’s the medical explanation for contagious yawning? Is there scientific proof that yawns are contagious? Did you know that animals yawn too? Need a good read for nap time? Check out other Perfect Picture Book Friday reviews on Susanna Leonard Hill’s blog.